Hi everyone! 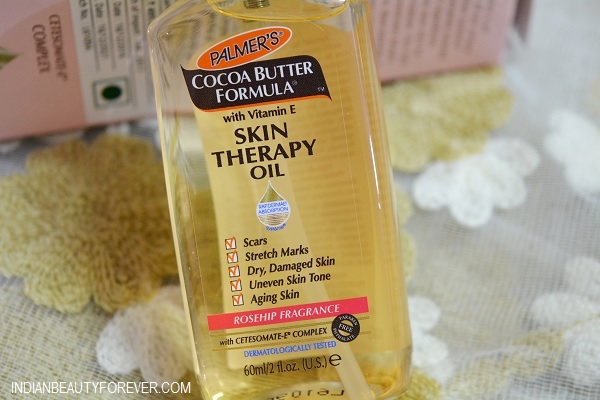 I am using this Palmer’s Cocoa Butter Skin Therapy Oil for the past three months and guess what, the product is extremely beneficial. Now, it’s almost over and I am quite satisfied with the product. After the pregnancy, I had used this oil and have gotten some commendable benefits. 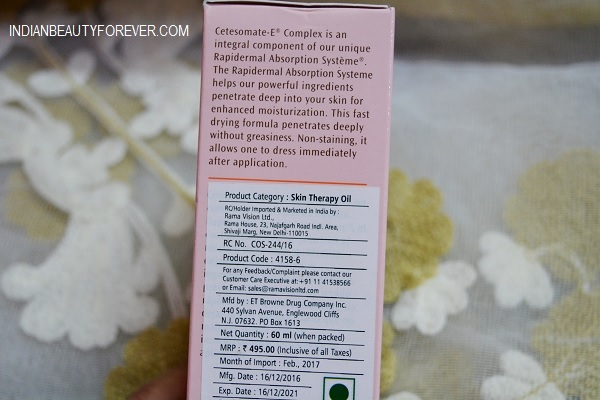 I have used quite a lot for Palmer’s products so far and most for them were brilliant and this is why it seems like the brand has also gained a lot of popularity in India. The oil is packaged in a pump dispenser which is quite easy to use. The oil is mildly fragranced oil which has a light brownish color. It is not as greasy and sticky but while I massage this over my skin, it blends and spreads really quick. Also it does not get rubbed off the clothes but gets inside the skin layers. Well, most of it! 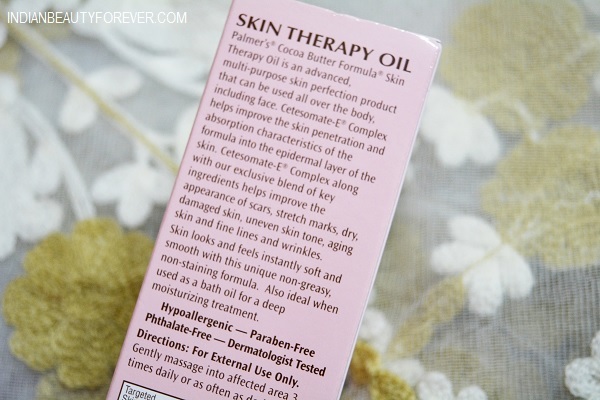 The Palmer’s Cocoa Butter Skin Therapy Oil is with the rosehip fragrance and I have used the other variant as well which was unscented. The oil is a face and body oil and primarily targets the dry skin, aging skin, sagging skin and the stretch marks. It can lighten the pigmented skin areas and also treats the uneven skin tone. 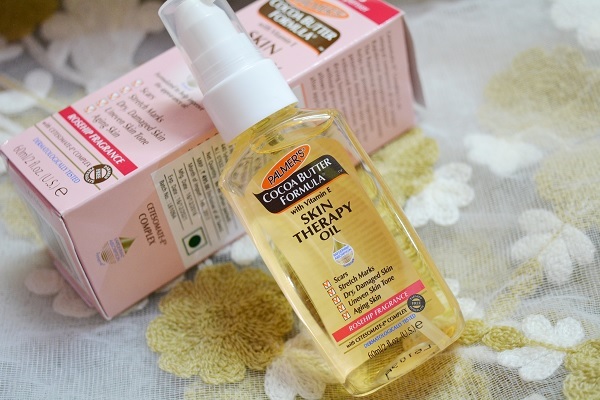 I have used this oil for two things, one is for my stretch marks and the second is the dryness of the cheeks. I don’t know why, in spite, of my skin being oily-combination kinds, it got dry. After the delivery, my face just got extremely sensitive and cheeks got very dry. Otherwise, even in winters my cheeks and overall face used to be pretty normal. So, I had used this twice in a day to get rid of the dryness of my and it actually worked well. For my stretch marks, I applied this oil regularly thrice in a day. Like, once after the shower then in the afternoon and then at night. Now, I have started to feel that it has reduced the scars and stretch marks to noticeable extent therefore, I am quite satisfied and will continue using this. There is no irritation, redness or burning after using this product, hence, suitable for the sensitive skin. I have also used other oils but this was the best and light. I would suggest that if you are worried about the stretch marks which can be due to the pregnancy, sudden weight loss, weight gain etc, then you should try an oil like this. 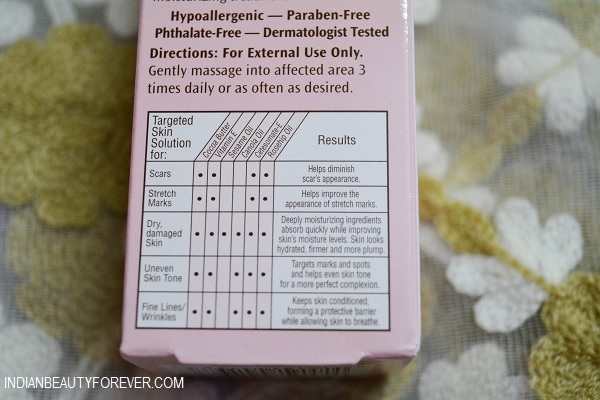 Additionally, it is free of parabens, phthalates, silicones etc. Palmer’s Cocoa Butter Skin Therapy Oil with Rosehip scent not just smells good but also works to fade the stretch marks and skin dryness. I am hoping that with regular use it can lighten the marks effectively.